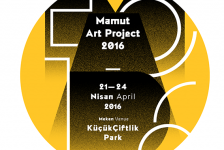 Mamut Art project Jury for 2016 are Ali Simsek, Banu Gundogdu, Erinc Seymen, Omer Koc and Fatos Ustek. Mamut Art Project was set off intending to be an alternative project, growing with emerging artists and their creations, supporting the concept of attainable art and to be repeated every year. With the aim of giving space and visibility to upcoming artists the project’s 1st year took place in May 2013 at Antrepo No:3. Project’s second year took place at KüçükÇiftlik Park in April 2014 with 54 artists selected from 730 applicants. Our 3rd year, we received around a 1000 applications and 57 were selected to whow their work at KüçükÇiftlik Park in March 2015. Artists, selected by a jury, formed with experts from various fields, were given the chance to manage their own exhibits within an interdisciplinary surrounding.